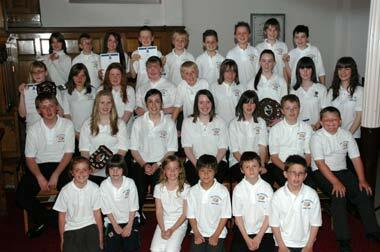 The junior band held it's annual concert and prize giving on Saturday 7th June 2007. The concert was held in the War Memorial Hall, Carrickfergus in front of a packed hall of friends and families of the performers. We were also delighted to have in a attendance Des Graham, and from Armagh Old Boys' Band, Ivor Stevenson - who both have been in hospital recently. Congratulations to all who took part in this concert, the tutors and those who won prizes for all the hard work and we look forward to more music making after the summer recess. Also our best wishes for a speedy recovery to both our own Des Graham and to Ivor Stevenson from Armagh Old Boys' Band after their recent surgeries.